These are NOT resolutions. I don’t do resolutions. But I was cleaning out my head the other night, and started making some lists. One of them was a list of things I want to do differently in the new year. So I might as well share them here. Stop printing so much. Last month, I was in a meeting with four school district employees and one other person. We were going through a 23-page document. All four of us had paper copies of the document we had marked up with our notes. The guest had no paper, just the digital document. Paper is a habit. I find myself printing documents, taking them to meetings, writing notes on them, and then… nothing. They go into binders or folders or file drawers. But they’re rarely used again. We need a culture shift. We need to stop printing and distributing documents and pretending that people will think we’re important if we pass around paper. For the last seven years, the printer in my office has literally been within reach of my desk. In my new office, there is no printer. Now, to print, I’ll need to get up from my desk, go to a different room, and pick up my documents. I’m not going to pretend that I’m going paperless. Every technologies has its place, and paper is no exception. But I want to move away from paper being the default format for my documents. We need a new habit. Reboot my PLN. In 2005, I embarked on an incredible journey that stared with blogs and podcasts and led to hundreds of hours of webcasting, scores of blog posts, new friends and colleagues from all over the world, and a trip to Africa. It turns out there are lots of people out there who have great ideas and are facing similar challenges as they try to improve education for our posterity. For a while, I thought of my personal learning network as a hobby more than anything. It distracted a bit from my job responsibilities, but it didn’t really have a tangible effect on my work. And that may have been true in the beginning. But as time went on, my learning network influenced my opinions, introduced me to new ideas, and gave me new lenses through which to see the educational and technology landscapes. It’s been the best professional development I’ve ever had, and it has changed my fundamental beliefs about education. But over the last couple years, my participation has waned. I’m almost never jumping into a webcast these days. My podcast feed still has lots of great stuff in it, but there aren’t very many education podcasts in the mix anymore. I read my Twitter stream only occasionally, and rarely engage in any meaningful conversation there. I have been noticeably less active in online forums and email lists. I have Flipboard and Paper.li configured, but rarely look at either one. I could claim that I’m busier now, that I don’t have time for these things. But I know that’s not the case. I need to get some new voices, do some pruning, and start paying more attention to what’s going on. That might mean new tools or new networks or new people, but I need to find a way to re-engage with the community. Schedule more time for reflection. In 2006, I made 100 blog posts. I did the same in 2007. Most of them weren’t very good. But still, that was two posts per week. In 2013, I posted 15 times. That’s on par with recent years, which have averaged about 17. The new posts are much better, but not nearly frequent enough. For every blog post I make, there are two or three ideas that never get written. I once told a colleague that if she seems that I’m not blogging, it means I’ve been too busy doing to spend time learning. I don’t know if that’s entirely accurate, but the pendulum has swung to far away from regular reflection. I find that I’m more articulate — in meetings, conversations, emails, and social networks — if I take some time to write my ideas out once in a while. I need to do more of that. Maybe they won’t be blog posts. Maybe they’re just ideas scribbled in the notebook. But I have to spend more time this year thinking and reflecting and writing. The process of learning requires acquisition of content followed by application or reflection on that content. Every week, I ask my staff to reflect on what they’ve learned that week, and to actually write a paragraph about it. I need to do more of that this year. Try to say “yes” more often. For me, this is year 15 in this job. One of the perils of staying that long is that I’m no longer on my first trip around the carousel. In my old age, I’ve become a bit of a curmudgeon. I don’t believe that this new product or pedagogical approach or testing regimen or evaluation program is going to revolutionize education. I don’t believe that iPads or Google Hangouts or 3D printers or maker spaces or Chromebooks or Khan Academy are going to save the world. But I have to stop dismissing everything out of hand. Yes, we’ve tried it before. No, it didn’t solve out problems. Yes, I’m willing to take another look. But I’m not interested in repeating the mistakes we have already made. So it’s a very fine line. I have to do a better job of asking good questions and keeping an open mind. Solve the LMS Problem. The one is different from the rest of the items on this list, because it’s not specifically about me. But it’s becoming increasingly clear in our school district that the lack of a unified learning management platform is inhibiting our teachers’ ability to embrace next generation learning. I’ve written in the past about LMS issues, and I’m not even convinced that having one is a good long term strategy. But we absolutely have to have one in the short term. Our teachers need to use an LMS to organize and deliver course content. It needs to be a place where is is easy to curate content, deliver it to students, and manage student engagement with that content. It has to be a collaborative space for teachers to share content, methods, and resources. And it needs to include assessment tools that make it easy to keep track of how students are doing. We do not have consensus on what we want in an LMS, and we do not have a budget for one. But we know that Moodle is no longer meeting out needs. No one seems to be very interested in iLearn Ohio, and pockets of teachers are spreading out in myriad directions looking at alternatives. We need to reign this in soon, get everyone on the same page, and move forward with a unified solution. They do look like resolutions, don’t they? They’re not. But they are goals. They’re a direction. They’re a reflection on where I’ve been and where I’m heading. Maybe they’re a roadmap for 2014. Let’s make it a good year. Photos from Jennifer DeWalt’s Ransom Note Generator. 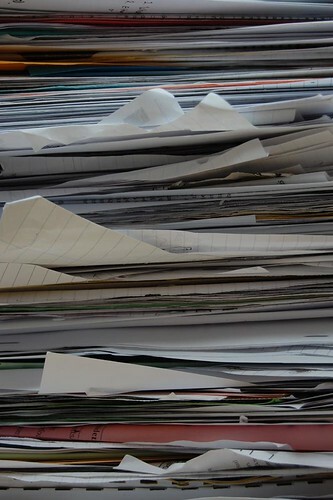 The experts have been predicting for decades that we are going paperless. The paperless office. The paperless school. The paperless bathroom. Okay, maybe not. But looking through this stack of papers brought home by my fifth grader, I can’t believe that we’re making any progress at all toward reducing our paper consumption. And one look at my desk would tell you that I’m about as paperless as a news stand. In the 1970’s, Xerox was so concerned about the promise of a paperless world that they set up the Palo Alto Research Center to figure out how the company could survive once people stopped printing. The researchers at PARC invented ethernet and laser printing and the graphical user interface and object oriented programming. Steve Jobs and Bill Gates famously stole ideas from PARC for their own products. And many of the researchers left PARC to start their own companies, including Adobe and 3Com. But Xerox? They just kept printing. For all of the efforts of the information age, we’re printing more than ever. Take a look at this document from the Resource Conservation Alliance and this one from ID2 Communications. Both are written from a conservationist perspective. Both have statistics about how much paper we actually use. Both are kind of out of date, which is why I’m not reproducing the numbers here. But what else do you notice about the documents? They’re documents. They’re formatted for printing. They assume that they’re going to be viewed on a standard US Letter size piece of paper. The second document is a little apologetic about it, asking people not to print it, or at least to print it on recycled paper. But if the goal is to get people to read it on a device rather than on paper, why is it still formatted for the printed page, with a layout that looks awful on my computer or tablet or (God help us) phone? Ryan Collins was thinking about this recently, and it became the basis for his Beyond Paperless presentation that I skipped didn’t have the opportunity to see at eTech this year. I hear he’s going to repeat it at the Catiie Conference in June, and I may not be able to avoid it be able to catch it this time around. Last week, I found myself in a meeting with my Superintendent and two school board members talking about Board Docs. This is a tool to computerize the process of building and disseminating agendas for school board meetings. Traditionally, the board agenda is posted on the web site a few days before the meeting. There are ancillary documents (called tab items) that are also assembled. These are things like contract proposals, studies, reports, and various documents that the board will discuss. All of this stuff is printed, and placed in a binder. A separate binder is prepared for each board member, the superintendent, the treasurer, and the news media. For a typical meeting, this can add up to a thousand pages or more. In an effort to improve transparency, the board has requested that we post all of the tab items on the web site when the agenda is posted. That way, any community member can see all of the details of all of the documents that the board is discussing. The next logical step, then, was what we were discussing at this meeting. Why do we need the binders at all? What if everyone just had a laptop or a tablet or something? We could project the agenda for the audience to see, and the board members wouldn’t need the binders. We talked for a while about logistics — would we have to buy computers, or could they use their own? How can board members take notes and annotate their documents? Can we embed things like videos and PowerPoint presentations that are typically shown at the meetings? As we talked, I could feel my to-do list piling up. How can I embed a PowerPoint presentation into the PDF of the board agenda, and how do I teach the administrative assistants in the central office how to do that? But I had missed the same thing you did when you looked at those pdfs about paper consumption. They were intrigued. I crossed off a bunch of things on my to-do list. Now, I just need to riff on this idea. I have to play with it with actual agendas and documents and see if I can put together something that will make sense. But the paradigm shift made all the difference. What if we did that in other places? What if we stop printing that stupid report each time a student takes an Accelerated Reader test? What if we stop making endless copies of workbook pages and find something a little more engaging for our students to do? What if we teach our students to do research by reading on screens and annotating or taking notes in a document, rather than printing everything out and grabbing a highlighter? What if our students share their work online, and their teachers make comments on it, or send them an email with their grade and feedback? Why do we have to do so much printing? Last week, we also had a tech team meeting. For the first time in 12 years, I didn’t print anything for the attendees. They noticed. They didn’t have anything to take notes on. But they didn’t need anything to take notes on. If they needed notes, they could have grabbed their devices and taken notes. None of them did. I don’t pretend that we’ll ever really be paperless. And I don’t necessarily think we should be. Paper is, after all, a remarkable technology. But when I look at the hundreds of thousands of dollars we spend each year on printing, I can’t help but think there must be a better way. Photo credit: Sean Stayte on Flickr.